New Riding DVD Helps Beginners And Experienced Riders Improve Performance And Enjoyment. Minette uses her lifetime’s experience to show how everyday riders with ordinary horses can dramatically improve both their performance and their enjoyment of riding through more effective communication with their horses. “Understanding the Art of Riding” – a 90-minute programme – is great value for beginners and improvers alike. 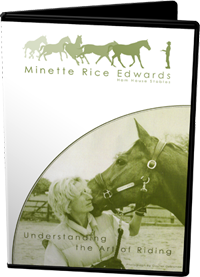 The first DVD covers: walk on the lunge; trot on the lunge; bending the horse and transitions. Future DVDs will cover a wide range of topics, all aimed at improving the riding experience and performance. “this is a very well put together DVD… it is full of straight forward common sense. There is something here for everyone, whatever their ability.” Jane Holderness-Roddam DVO, Olympic Team Medallist and former Chairman of the Riding for the Disabled Association. “A beautifully crafted presentation of the essentials of good riding. This DVD fulfils and important role by introducing the beginner to the mystery of educated riding.” Daniel Pevsner, Fellow of The British Horse Society. “The DVD is a labour of love” says Minette “as it is the essence of the core principles I have learned over the years. I wanted to make that more widely available – both for my customers to use at home and for a wider audience who are seeking expert guidance on how to get the best from their riding. Image of Actual DVD – The Art of Riding Costing £20.00 the DVD is available to purchase online.